Complete Streets is a public policy that enables municipalities to create safer, more accessible streets for all users. Walkability, bikeability, and ease of access plays a large role in making a community livable and appealing. If a town is easy to travel for people of all ages and abilities, residents can feel more connected to their community. Walkability and bikeability can also attract visitors, boosting tourism and economic development. Implementing a Complete Streets policy is one way that a municipality can improve walkability and bikability, making the community engaging and inviting. Complete Streets are streets that accommodate all users, such as pedestrians, bicyclists, motorists and transit riders. Complete Streets can make a community more livable and appealing for residents of all ages and abilities by making it easy to cross the street, walk to shops, bicycle to work and use public transit. Municipalities or counties can choose to adopt Complete Streets policies to create safe and accessible transportation choices for residents. What do Complete Streets look like? Complete Streets is not a “one size fits all” approach to planning. Rather, it is a balanced approach that recognizes that cars are not the only way to travel. A complete street may include: sidewalks, bike lanes, wide paved shoulders, special bus lanes, comfortable and accessible public transportation stops, frequent and safe crossing opportunities, median islands, accessible pedestrian signals, curb extensions, narrower travel lanes, roundabouts, and more. Who benefits from Complete Streets? Municipalities – walkable communities are more livable and promote economic development. 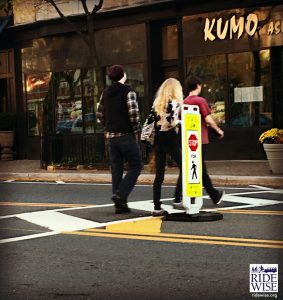 Pedestrians – when pedestrians can walk safely, traffic is reduced. Bicyclists – when bicyclists have designated lanes, there is less conflict with vehicles. Transit riders –transit usage increases when stops are comfortable and accessible. Children – can play safely in a neighborhood without fear of traffic. Senior citizens – can walk to nearby destinations and age in place. Persons with disabilities – can travel safely and independently. Motorists – pedestrian and bicyclist behavior is more predictable, making crashes less severe. By assisting municipalities with documentation for Sustainable Jersey. Interested in learning more about Complete Streets? Contact RideWise at staff@ridewise.org or 908-704-1011.